When a landscaper alerted Boris Volshteyn to smoke pouring out of a nearby mansion, the plastic surgeon hurried home and found his friend and neighbor lying face down out front. His first thought was to try CPR, but it was no use. Hopes that Caneiro's wife and two young children weren't inside as the inferno raged from early afternoon the Tuesday before Thanksgiving until at least midnight were dashed when they failed to turn up elsewhere. Friends who had gathered outside called the children's school and Jennifer Caneiro's cellphone. "When the kids were not in school, and Jennifer was not answering, it all became a grim picture," Volshteyn told The Associated Press on Tuesday. "To the very last minute, all the neighbors were hoping that the kids were spared." As they puzzled over the bizarre crime in pastoral Colts Neck, a wealthy enclave for horse breeders, hedge fund managers and celebrities near the northern New Jersey coast, Caneiro's business partner and brother, Paul, was charged with setting his own family home on fire earlier the same day. "We have a lot of jittery people that have questions that we don't have answers to," said Mayor J.P. Bartolomeo, who nonetheless said that he believes the crime was an isolated one and that the community is safe. "His family is supportive of him and wants to see him come home," said Honecker, a former prosecutor in Monmouth County. "He's been living in that house for over 20 years. He's got two businesses that need to be run. And he's got no prior record." 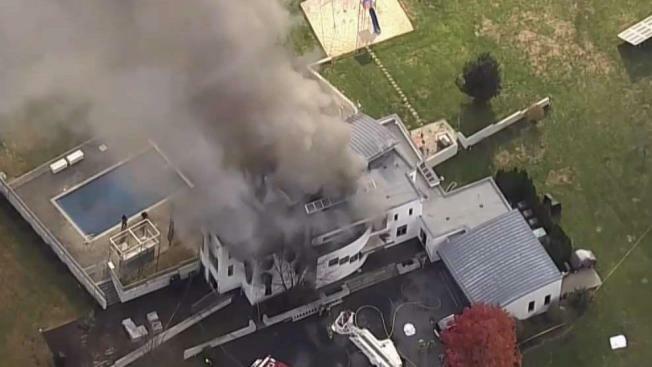 Police say Paul Caneiro used gasoline to fuel the fire at his two-story Colonial in Ocean Township, about 10 miles from his brother's jarringly modern, all-white $1.5 million home in Colts Neck, which sits next to a small organic farm with sheep dotting the pasture. Paul Caneiro was seen outside his own burning home with his family throughout that morning, visibly upset. Honecker said he went from there to the police station for an interview around noon and was there when he learned his brother's family had been killed. "He's never been charged with anything in Colts Neck," Honecker said. "He is obviously still devastated by the news of his brother and his family's deaths." Jennifer Caneiro, 45, was active at her children's school. She also enjoyed exercising, going to the beach and trips to a family home in Greece, her obituary said. She and Keith also took frequent trips to Atlantic City, Volshteyn said. Family members, including a third brother, have declined to speak to The Associated Press this month. Prosecutors have said little about the case since an early news conference at which they called the Colts Neck slayings "targeted." Celebrities with ties to Colts Neck include Bruce Springsteen, who owns an estate there; former "Daily Show" host Jon Stewart and his wife, who operate an animal sanctuary; and Queen Latifah, who sold her mansion in 2015. Christine Conroy, a longtime local who was out with her sister Tuesday at nearby Stonehenge Stables, said some of the new homes in town sit empty because "people mysteriously go bust." "There's a bit of a culture clash," she said, between old and new residents. "It's a little bit hard to come home and drive past the house. It's a reminder of what happened," Volshteyn said. "And for a lot of the kids, too, it's hard to understand."